Mashed potatoes are definitely on my comfort food list. I would say it’s a close second behind mac & cheese. When I’m wanting one and can’t get it, the other one is an acceptable substitute. Lucky for me, hubby is not a fan of either, so I never have to worry about not getting enough. I had a girls night out this week and he was in charge of his dinner. (Yes, I usually make sure he is well supplied with leftovers, but we already ate all of them.) He opted for a home-style grilled chicken dinner with steamed vegetables and mashed potatoes. Like most portion sizes these days, the dinner came with not one but two ridiculously large scoops of mashed potatoes. I was surprised he even ate one and then he told me he purposely saved the second one for he knew I would want to do something with it. Insert smiley face… he sure knows me! When I heard I had leftover mashed potatoes, I immediately just wanted to eat them with a bunch of cheese, but since he did save them from his dinner, I thought I would share. As I was thinking of my cheesy mashed potatoes that I was missing out on, my cheese thoughts turned to an au gratin. Then I thought hubby would never eat that…unless I put crab or shrimp in it. I just so happened to have some crabmeat in the freezer. 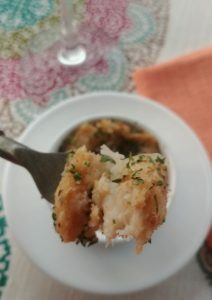 This recipe, unlike regular crabmeat au gratins, works well with the less expensive crabmeat-like claw or backfin because the potatoes add another level of flavor and density. The potatoes also keep the dish from becoming so rich it feels sinful to eat, too. Want some healthy eating bonus points? You can even use skim milk in this recipe! For those of you that know me, yes, I did go light on the cheese in this recipe but only because it was all I had on hand. 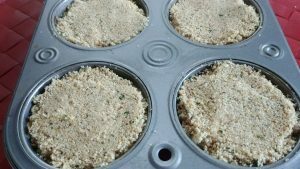 Don’t worry if you don’t have ramekins, simply use a well-greased muffin tin. When done, let them cool a bit and run a knife around the edge to lift each one out. Line greased 2 oz ramekins or muffin tin with mashed potatoes. In a small saucepan, melt 1 TBSP butter over medium heat, blend in flour and Cajun seasoning, stir until smooth, gradually whisk in milk. Bring to a boil. Whisk in brandy, Worcestershire sauce, and hot sauce. Cook 1 minute. Add crabmeat. Continue to cook 1-2 minutes longer or until thickened. Remove from hat. Stir in cheese. Keep stirring until cheese is well blended. In a small skillet, melt 1/2 TBSP butter. Stir in breadcrumbs until lightly toasted. Remove from heat. Mix in Parmesan cheese. 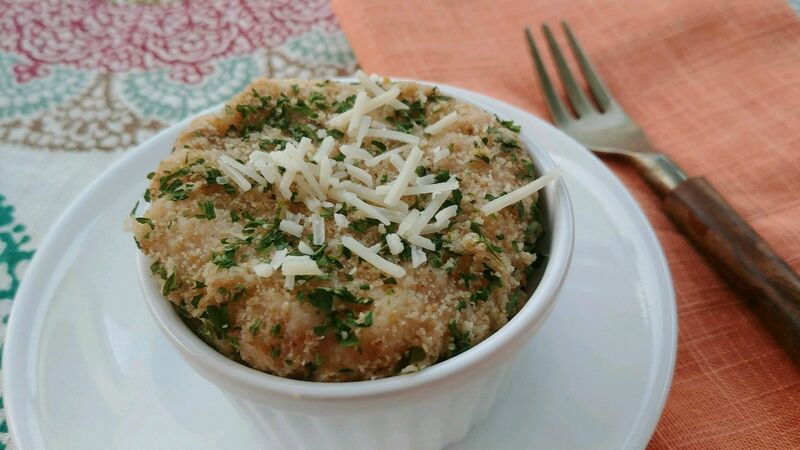 Add crabmeat topping to each ramekin or muffin well. Can substitute 1/2 cup cooked shrimp or crawfish for the crabmeat. Can also melt butter in microwave and simply stir in breadcrumbs and Parmesan cheese for the buttered bread crumbs. Put your TO COOK TO CREATE thinking cap on: No crabmeat? No problem, simply substitute 1/2 cup cooked shrimp or crawfish. Want to really up the flavor game? 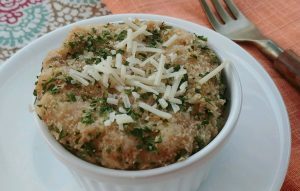 Use fully loaded or garlic mashed potatoes or add crumbled cooked bacon or chives. Think of all the wonderful cheese combinations. I used what I had on hand, a Monterey Jack and cheddar blend, but Swiss, and Gruyère are good choices, too. I can’t wait to try goat cheese. Not in the mood for seafood? Add rotisserie chicken to the cheese mixture or even just lightly steamed chopped vegetables. Have leftover roast? Chop it and add it. Think about what you enjoy in your mashed potatoes and give it a whirl…after all mostly everything is delicious in a cheese sauce. If you really love cheese, just add more cheese. Can even have an all cheese potatoes au gratin. No leftover mashed potatoes? 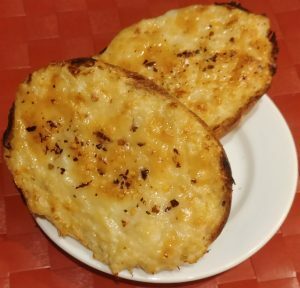 Simply spread mixture on baguette or French bread rolls, top with some shredded cheese, broil until melted and toasty! FOOD FUN: It is believed that the earliest known mashed potato recipe published was in The Art of Cookery cookbook by Hannah Glasse, an Englishwoman, in 1747. I sure wish I could write her a thank you letter for all the delightful hours I have spent savoring every bite of mashed potatoes in my life!